After leaving Salesforce after five and a half years, I am often asked by entrepreneurs and venture investors what the next generation of CRM looks like. Or the billion-dollar question: Who will disrupt Salesforce.com? I have seen well written articles about the future of CRM like this post but I don't view the world of CRM through this narrow lens. And, I personally believe that Salesforce is well on its way to being a $10 Billion dollar company with a winning platform. You don't disrupt a winner by doing what it does A much more interesting question is - what is the future of customer relationship management? While there are many interesting CRM startups, I believe that the future of CRM is already here - we just don't recognize it. As the famous quote from William Gibson says - The Future is already here - its just not very evenly distributed. 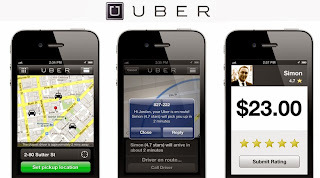 Uber is CRM: If you think about what Uber is doing - its helping taxi drivers and customers connect with each other in real-time, conduct the transaction and manage the relationship including the feedback loop. 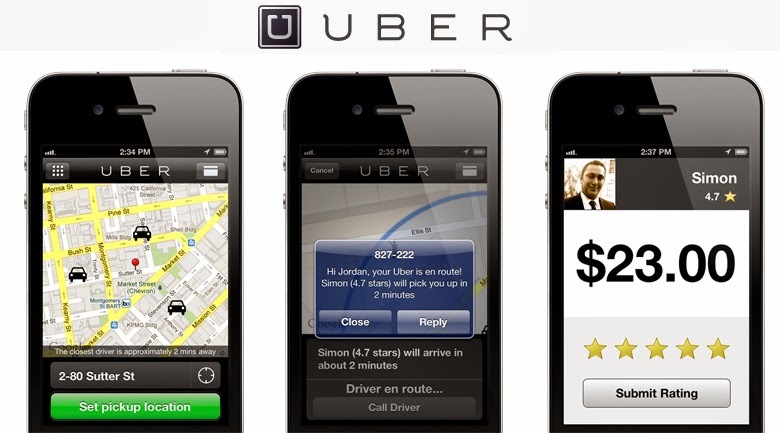 While Uber is clearly a "taxi app" - it can also be thought of as the perfect CRM tool for its chosen market. Simple is CRM: Simple is a not so widely known banking app. Its mobile app that is your bank. You can manage all aspects of your relationship with the bank via this app. While most leading banks now have a banking app, Simple is taking it to the logical extreme. AirBnB is CRM: If you are renting a vacation home, you and and the homeowner are now in a relationship that must be managed from booking the home to taking care of paperwork. AirBnB is a complete CRM because it allows you and the homeowner to manage all aspects of your relationship. Trulia is CRM: If you are a real-estate agent, the Trulia app combined with its recent acquisition of Market Leader is the end to end CRM system. OpenTable is CRM: If you are a restaurant owner, you manage your customer relationship starting with reservations via OpenTable. Traditional CRM systems like Siebel have focused on automating the sales process typically in a business to business setting. And the modern CRM companies have greatly improved that experience but managing a relationship with a customer goes beyond converting an opportunity - it goes to truly managing the lifecyle of your relationship with the customer. Note how the businesses using Trulia, OpenTable, AirBnB are not even in the market for "CRM". This is what real disruption looks like. CRM is inherently vertical if you want to automate and optimize not just the lead to quote process or better run a call center but to truly help businesses manage the relationship with their customers. When you are renting a hotel room - booking the room is core your relationship with the hotel; when you are dealing with a car dealership the auto repair experience is at the core of your relationship. Its not sufficient to simply keep your contact information - the so-called 360 degree view of the customer is often just a collection of records how the business has interacted with the customer. You want a 360 degree interaction - not just a view. This means businesses will increasingly look for applications that help them interact with their customers better - and as this interaction moves to mobile (from phone calls and web), the CRM systems will manifest them as the app. I see a whole new generation of mobile apps that are the next generation of CRM for doctors, restaurants, car dealers, pharma companies, taxi drivers. great post - breaks traditional way of defining CRM. I remember looking at OpenTable when I was at SAP Ventures and what struck me as really different about their strategy is the fact that they weren't delivering an online reservation system, they were building a reservation system that was indifferent to the method by which the reservation was booked. They delivered a better system for restaurants to use and that got them the supply side of the equation, and because they never took their eye off the customer experience they ended up dominating the demand side by appealing to consumer with something that put them first. I am still amazed that companies like Yelp never seemed to figure this out, that it was always about a lot more than the online experience for someone sitting at their browser. @Jeff, I agree that nailing the demand side of CRM is a key differentiator for many of these next-gen CRM. You could even make a case that these are all "Outside In" CRM systems - built for the customers first. And if you compare this to traditional Salesforce Automation and Customer Service systems - they are built for employees first. That is a quite simplistic way of redefining ALL of CRM functionality in one thought. CRM is very process driven depending on what the company does. Yes, if the website relies on the customers to sign themselves up on their system, you still need some processes to automate the "sales process". I happen to know that AirBnB in the beginning was completely ignoring any kind of SFA tools and as they had to do land graps when attacked by 9Flats and all the other clones, they needed an effective contact system for outbound sales efforts, to force new sign-ups and they needed to keep track of who they rang and spoke to and what the potential user said. This called for a standard CRM solution like SFDC or ZOHO (which they use today). The fact that their backend only deals with the relationship between the renter, property owner and AirBnB, left a lot to be desired. The problem for the AirCrew (sales) was that new leads that were manually discovered, went on FB to sign up, because of the ease of use and thus cheated many salespeople out of their hard earned commissions. I know, as they still owe me over $4,000 and ZOHO has never paid me my partner commissions when I got them introduced to AirBnB! So my opinion is that CRM is much more than just what you show in the examples and it will continue to be so for years to come.